王润芝, 吴皓, 刘一鸣, 曹丁, 吴涯昆, 李金政, 龚建平. 阻断Kupffer细胞IRE1-XBP1通路对大鼠肝移植排斥反应的影响[J]. 第三军医大学学报,2016, 38(22): 2431-2437. Wang Runzhi,Wu Hao,Liu Yiming,Cao Ding,Wu Yakun,Li Jinzheng,Gong Jianping. Effects of inhibiting IRE1-XBP1 pathway in Kupffer cells in rats after liver transplant rejection[J]. J Third Mil Med Univ, 2016, 38(22): 2431-2437. [Abstract] Objective To investigate the effects of inhibiting inositol requiring 1-X-Box binding protein 1 (IRE1-XBP1) pathway in Kupffer cells (KCs) on liver transplant rejection in rats. Methods Orthotopic liver transplantation in rats was established with or without GdCl3 treatment pre-operation. In untreated group, the rats were divided randomly into 3 subgroups, that is, XBP1-shRNA group (A), Scrambled-shRNA group (B), and PBS group (C). Likewise, the treated group was sub-divided into GdCl3+XBP1-shRNA group (D), GdCl3+Scrambled-shRNA group (E), and GdCl3+PBS group (F). 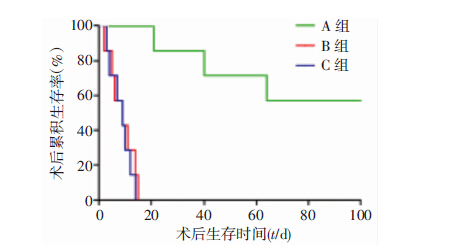 In untreated group, the serum levels of alanine aminotransferase (ALT), aspartate aminotransferase (AST), interferon-γ(IFN-γ), interleukin-10 (IL-10) and IL-17 were examined at different time points after operation. Liver tissues were excised for hematoxylin and eosin (HE) staining, mRNA expression levels of transcriptional factors (T-bet and RORγt) and cytokines (IFN-γ, IL-17 and IL-10) quantified by real-time PCR (RT-PCR), and protein levels of CD86, CD206, IFN-γ, IL-17 and IL-10 by Western blotting. Banff schema was used for grading the acute allograft rejection with rejection activity index (RAI). The survival rate was assessed by Kaplan-Meier curve analysis. In the treated group, the mRNA and the protein expression of IFN-γ, IL-17 and IL-10 was also tested. Results In the untreated group, the serum levels of ALT and AST at different time points were significantly lower in group A compared with groups B and C (P < 0.05). In group A, IFN-γand IL-17 were significantly decreased in serum while IL-10 was significantly increased (P < 0.05). There were consistent with the results of RT-PCR and western blotting. In addition, the relative mRNA expression of T-bet/RORγt was decreased, protein expression of CD86 decreased and CD206 increased, which were all statistically significant (P < 0.05). In contrast, groups B and C showed inverse trend with respect to the above-mentioned factors, mRNA and protein expressions. Moreover, the differences between group B and C were not significant. The mean RAI score in group A was 3.81±0.14, which was significantly lower than that in groups B (9.13±0.20) and C (8.95±0.26), respectively (P < 0.05). The data was also in agreement with the Kaplan-Meier curve, showing that rats in group A significantly survived longer than these in groups B and C (P < 0.05). However, the expression of IFN-γ, IL-17 and IL-10 both at mRNA and protein levels was not significantly different among the treatment groups D, E, and F. The same results in pathological examination were observed. Conclusion The blockage of IRE1-XBP1 pathway could alter the polarization of KCs from M1 to M2 type, lead to skewing of Th1/Th17 towards Th2/Treg, and consequently ameliorate acute rejection following liver transplantation in rats. 王润芝, 吴皓, 刘一鸣, 曹丁, 吴涯昆, 李金政, 龚建平. Wang Runzhi, Wu Hao, Liu Yiming, Cao Ding, Wu Yakun, Li Jinzheng, Gong Jianping.